YouTube ripping websites all around the world should take notice. By the looks of it, all YouTube-MP3-like stream ripping websites that are involved in “ripping” (the process copying audio or video content from a streaming media) should brace themselves for some serious trouble. A YouTube-MP3 stream ripping website has been sued by organizations such as IFPI, RIAA, and BPI. Not a very pleasant news for owners of any kind of stream ripping websites or is it? A mega alliance of recording labels has begun proceedings against the number one YouTube stream ripping website in the world. The alliance consists of members such as IFPI, RIAA, and BPI. The UK-based alliance recently stated that they were taking legal action against YouTube-MP3 stream ripping website to guard the rights of artists and labels. According to many reports, YouTube MP3 is one of the most visited sites in the world with a month visitor count exceeding the 60 million mark. It has also been reported that the site rakes in million of dollars on a yearly basis. The overwhelming part of the site’s earnings come from advertising revenues. In a recent (about three weeks old to be exact) research report published by the International Federation of the Phonographic Industry, it was claimed that over half of the people between the ages of 16 and 24, used stream ripping websites that helped these users with ripping content from streams. These stream ripping websites utilized several tools to copy audio files from streaming websites like YouTube. The International Federation of the Phonographic Industry also reported that the problem of users turning to stream ripping sites that “stole” content from streaming websites had gone out of hand. The organization said that as far the usage statistics went, the problem of stream ripping had overtaken the traditionally maligned “torrent downloading” from pirate websites. This piece of news should not come as a surprise to anyone who has been following piracy news lately since almost all major torrent sites, such as KickassTorrent and Torrent Hound, are going through tumultuous times. The world’s number one stream ripping website YouTube-mp3.org was also sued by the largest consortium of recording labels about a week ago in the California District Court. That coalition consisted of mega organizations including UMG Recordings, Atlantic Records, Warner Bros, Capitol Records and Arista Records along with several other organizations. All of them claimed that the hugely popular YouTube stream ripping website by the name of YouTube-MP3.org (also known as YTMP3), had been involved in multiple copyright violations. The alliance also accused the Philip Matesanz, the site’s owner, and Does 1-10. In a complaint that was presented in the court, it was stated that YouTube-Mp3 stream ripping website rapidly and seamlessly removed the audio tracks contained in videos streamed from popular streaming websites such as YouTube and that YTMP3’s users accessed those services through the site’s services. It was also stated that users the site converted those audio tracks to an MP3 format, copied them and then stored them on YTMP3 servers. The complaint further added that, after the initial process, the site then distributed copies of the MP3 audio files from its servers to its users in the United States of America and hence enabled its users to download those MP3 files to their computers and other mobile devices such as tablets and smartphones. The recording label alliance also alleged that YouTube-MP3, the steam ripping website in question, was one of the most used YouTube stream ripping websites in the world. The coalition brought this point to light in order to show that the site’s owner, PMD Technologies UG (a company based in Germany), was making millions of dollars of the back of hard working artists and other content creators around the world. They then brought light to the fact that the site made handsome profits by violating intellectual property rights. Bing will also join anti-piracy groups in taking off illegal content from the web. The labels also added that the defendants were depriving Plaintiffs and their recording artists of the fruits of their labor. They further said that defendants were profiting from the operation of the YTMP3 stream ripping website. It was also claimed that through the promise of illicit delivery of free music, Defendants had attracted millions of users to the YTMP3 stream ripping website which in turn, generated massive advertising revenues for the Defendants. As indicated before, the last couple of months have been anything but smooth for pirates and people running the piracy business through file-sharing and stream ripping websites. Perhaps it would be pertinent to point that YouTube-MP3 stream ripping websites was charged for secondhand,contributory, vicarious and inducement of copyright infringement, plus circumvention of technological measures. Moreover, the labels demanded, among other things, an introductory and indefinite injunction that forbade the Defendants from further violation of copyright materials. The labels also wanted YouTube-MP3 stream ripping website to shut down and give up the domain name altogether. Frances More, who is the Chief Executive of IFPI, said that the demands made by the labels were a result of a coordinated action to protect the rights of artists and labels from the blatant infringement of YouTube-mp3, the world’s single-largest stream ripping website. Furthermore, he added that music companies along with digital services today offered fans more options than ever before to listen to music legally, whenever and wherever they wanted. Frances said that the labels had worked hard to provide the users with over hundreds of services with scores of million of tracks and all the while they compensated artists and labels. He finished his comment by saying that stream ripping websites on the internet should not be allowed to jeopardize the system. 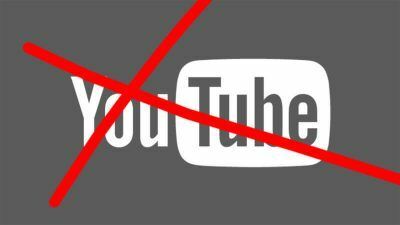 The Chief Executive Officer and the Chairman of the Recording Industry Association of America (RIAA), Cary Sherman, said that YouTube-MP3 stream ripping website was taking a ton of money on the back of their business and needed to be stopped as soon as possible. He noted that the site was raking in millions on the backs of artists, songwriters, and labels and that they were doing their part but everyone in the music ecosystem who believed that artists should be compensated for their work had a definitive role to play. Sherman was of the opinion that it should not be so simple for people to engage in stream ripping activities in the first place and no stream ripping website should appear at the top of any search result or app chart. Geoff Taylor, who holds the position of Chief Executive at the British Phonographic Industry, said that the time was ripe for web services and related organizations to block or at least prevent themselves from inadvertently supporting operations such as stream ripping websites and torrent file-sharing websites. While talking to reporters Taylor said that it was time to stop illegal sites like YouTube-MP3.org that built massive fortunes by ripping off artists and labels. He also stated that as a result of modern technology fans now had access to a tremendous range of legal music streaming services but they could only exist if organizations such as the British Phonographic Industry took action to tackle the online black market. Taylor concluded his remarks by saying that his organization hoped that responsible advertisers, search engines along with hosting services would also reflect on the ethics of supporting stream ripping websites that made huge sums of money by defrauding content creators. Philip Matesanz, the owner of YouTube-MP3 stream ripping website, was contacted by TorrentFreak to make a comment on the issue at hand but were unsuccessful in their attempts to receive a response. More specifically, Microsoft Bing added a brand new system to its dashboard which enables any copyright holder to claim and monitor the status of his/her/their DMCA complaints to the search engine. Microsoft introduced the new system a couple of days ago. At the core of the tool, Microsoft added a new dashboard which will be provided to anyone who has a Microsoft account. One has to wonder, where will all this stop. There seems to be an infinite amount of content on the web that is being distributed through illegal means. To stop entities from spreading copyrighted content, anti-piracy groups and other companies, such as Microsoft, have made enormous efforts to little avail. Perhaps it should become apparent now that the job of regulating copyrighted content on the web is a monumental one that can’t be easily accomplished. More and more actors on both sides of the war, pirates and copyright holders, are shifting towards the opinion that the task of protecting content from being infringed upon is a fruitless one. One of the major reasons for that opinion is the fact that as soon as some copyrighted content is taken down because of intellectual copyright violation, another copy of the removed content appears someplace else and hence anti-piracy groups have to start all over again in a never-ending game of cat and mouse. Of course, that does not, by any means, stop people from trying to copy original content or protect intellectual property rights. Microsoft will now help copyright holders, just like Google. Various reports in the media revealed a couple of days ago that Google was being kept pretty busy by the pirate industry as the technology giant had to process a record-breaking 24 million links that lead to illegal file-sharing websites’ pages every week on the month. The 24 million links that lead to illegal websites, is actually more than double the number of complaints the search engine had received around this time in the year 2015. As can be judged by the recent activities of giant alliances and other anti-piracy groups such as BREIN and BPI, the majority of the complaints that Google receives every year as submitted to the search engine by these large entertainment industry groups. These groups have access to unique and distinct tools that are actually provided to them by Google itself. Players in the entertainment industry that aren’t considered “huge” or are not part of any major alliance don’t get the same kind of tools and have to content themselves with regular methods such as takedown requests and a convoluted process that is a bit too long and boring to describe here. Regardless, the process of having content removed from another search engine, Microsoft Bing, has just gotten easier because, now, Microsoft itself has introduced a new system that may prove to be quite useful for copyright holders regardless of their size or power. In a statement made yesterday, Microsoft announced that the lack of communication was the leading cause of divorce (not sure if the company had to bring that into the equation but whatever) and that communication was vital and sharing the status of a copyright infringement notice was no exception. The company then stated that this was the price reason why Microsoft Bring brought new tools to make it easier for the search engine and the copyright holder to communicate effectively. The statement further added that a new online dashboard provided insights into the status of a copyright removal request as well as an overall historical submission statistics. Microsoft also said that the new dashboard was now available for users who submitted DMCA notices via the company’s online form or API. 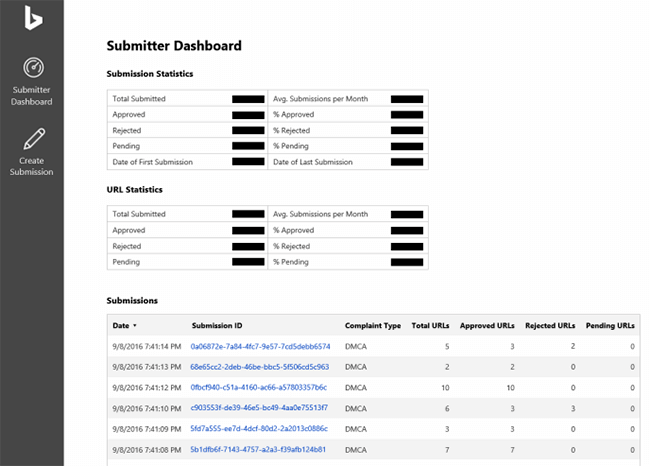 As indicated earlier, the DMCA monitoring dashboard is not aimed at only large entertainment industry groups. Essentially, anyone who has a Microsoft email account can access the new dashboard and file a complaint with Microsoft if there is a case of copyright violation. The process of submitting a complaint can be completed in a variety of ways such as an email, an online form or by means of an API (available only to trusted bulk submitters). However, Bing Program Manager Chad Foster explained on the official website that email was the least efficient method because it was prone to errors such as missing or incomplete information. 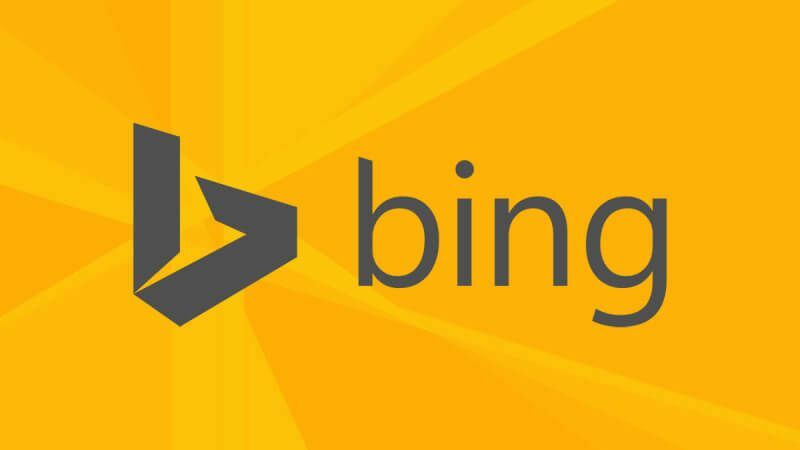 In an official statement, Bing said that Bing wanted to ensure that copyright owners sent valid DMCA notices and that those notices were acted upon quickly. The statement further said that the online form and API helped accomplish that goal and having insights into the status of these notices helped copyright owners stay better informed and in turn promoted the use of such tools to help Bing respond in an expeditious manner. Lastly, it should be mentioned that while Bing has made encouraging steps to protect copyrighted content, it is still way behind rivals such as Google in terms of providing the same kind of transparency in the process. One look at Bing’s Transparency Report should immediately make it clear that Google, which rejects just 2.2% of the total takedown requests compared to Bing’s 0.6%, certainly has better transparency tools than Bing.